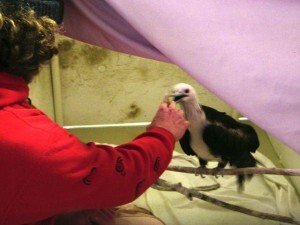 Today’s Guest Post is written by Monte Merrick, wildlife rehabilitator and co-director of the Humboldt Wildlife Care Center/bird ally x in Arcata, CA. The species name is long enough to be the middle line of a formal English haiku. So we used MAFR, the American Ornithological Union’s 4-letter code. This may have also helped us accomplish our daily tasks without swooning every time the name was said. Magnificent Frigatebird (Fregata magnificens). Just saying the name aloud gives a hint of the sensation of their floating flight. In an aviary, I watched as a young bird regaining strength turned on her perch and faced the offshore breeze, spread her nine foot wingspan, and simply lifted from her perch, more levitation than powered flight. Less than 2000 grams – more sail, it seems, than bird. More commonly seen in care in Central America, over the last 16 years I’ve had the privilege of providing a frigatebird’s care only twice. In February 2004, a young frigatebird blown into the Northern Pacific by a storm landed on a vessel bound for Vancouver, British Columbia. In port, the local rehabilitators thought it would be best for her to treated closer to her home, at a facility dedicated to aquatic birds. I happened to work at that facility, for International Bird Rescue at the Los Angeles Oiled Bird Care and Education Center, part of the Oiled Wildlife Care Network. After going the through the “red tape” of the international border crossing, the bird was sent by jet to us in LA. One of the most important pieces of good wildlife rehabilitation, of course, is knowing the natural history of your patient. This was the first time I’d ever seen a frigatebird, let alone tried to provide appropriate housing and diet. There are excellent resources available, both in print and online (Birds of North America is an indispensable online resource for the wild bird caregiver). In a quick review, you learn frigatebirds eat fish. You also learn that for birds that spend most of their lives drifting above the ocean and sleeping on the wing, the species isn’t exactly aquatic. No, frigatebirds, with their long, cormorant-like bill, either swoop over the surface of the sea scooping small fish without landing on or even really touching the water; or – and this is especially difficult to re-create in care – they harass other fish-eating birds until those birds vomit their prey, then the frigatebird catches the falling regurgitated fish before it hits the sea! 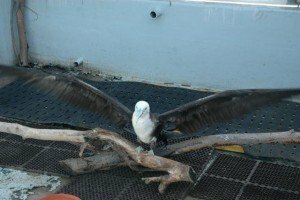 The frigatebird we had in care in 2004 never ate the fish that we offered on her own. We “assist-fed” her – placing fish in her mouth and waiting to make sure she swallowed them – every meal. As mentioned, frigatebirds spend a lot of time aloft. In an aviary, a recovering bird will spend all of her time perching; so caring for her feet, which are not evolved to a lifetime of bearing weight, is a top priority. Along with her feet, her feathers are also at risk in captivity. frigatebirds have a wingspan of nearly nine feet, a very long humerus, long radius and ulna, and even longer digits and primary, or flight feathers. Those primary feathers need to be kept whole, so perching must also be high enough that her feathers don’t drag on the ground. But for a weak, starving juvenile, there is the magic of fish to help. After six weeks of cautious monitoring of her feet, assist-feeding, and giddily watching her levitate from the highest perch, her body condition was restored, her blood values returned to normal, and she was ready to release. Over 140 oil rigs in the Gulf were damaged during Katrina. More than 40 individual oil spills occurred on the mainland. Tanks that held millions of gallons of oil disappeared in the storm. The oil was everywhere and I was part of the response team. We drove on closed highways; we crossed small sections of the Gulf, or bays behind barrier islands, in small craft. We went from one disastrous spill to another, searching for oiled birds, but mostly documenting the dead. Magnificent Frigatebirds were everywhere. I think most rehabilitators can attest to the strangeness of getting to know a species first in your hand, and later in the wild. It’s like seeing an old friend at a distance. Crossing to some island oil storage facility, or being taken around an oily bayou in an airboat, the frigatebirds were a constant, drifting lazily above us, seeming without concern for the wreckage below, but who knows. Maybe they were well aware of the scope of the disaster. I mention this, not because we encountered any oiled or injured frigatebirds – we did not. But while there I dreamed of them, or one specifically, who chased me through a grassy island – confronting me. I woke from the dream startled by the intensity of the bird’s intention, gazing through me, seeing what in dreamland felt like my essence – the gaze of a god. The day after, a colleague and I were flown by helicopter to a small town along the Mississippi River that was still isolated by flood waters nearly three weeks after Katrina tore through. Enormous oil tanks were wrinkled and tossed aside like empty soda cans. Oil was everywhere. It had taken the company this long to get a team out to rescue any impacted wild animals. Due to insufferable delays we arrived at 3 in the afternoon and were told we had 45 minutes to search. I captured a totally oil-blackened Killdeer, and every other bird we found was dead. I boxed the Killdeer to prepare for our flight back. As the helicopter lifted I saw a juvenile frigatebird perched on a bit of dock that remained. I turned off the headphones that allowed me to communicate with the pilot and my colleague, in the front seats, and watched the wreckage roll by on the ground and water below. When we landed, forty-five minutes later, the pilot was ashen, as was my colleague. Literally, they were so pale I thought they were sick. Neither was speaking. I asked what was the matter, and the pilot looked at me astonished. “Didn’t you see that?” he asked. “We almost died up there.” he croaked. Apparently a frigatebird had nearly come through the windshield of the helicopter. At our speed and height we would have crashed into the drink – our certain death avoided only because of a last minute swerve by the bird. I’m glad we lived. I wish I had seen the bird. Imagine, though, the chances of being killed in a helicopter by a frigatebird! Even such a close call is enough to make a person include it a story about frigatebird rehabilitation, though it has nothing to do with it at all. 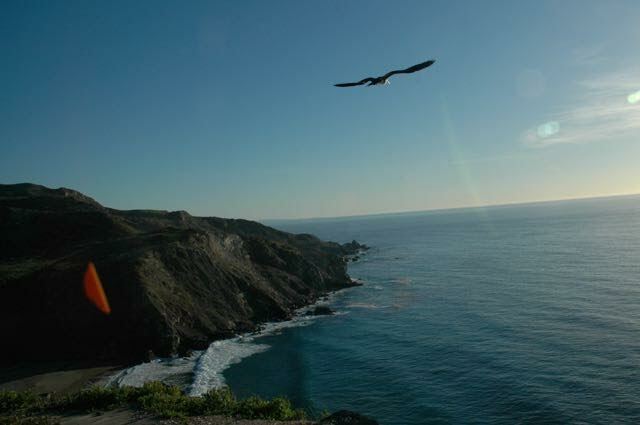 In January 2008, a day after hurricane force winds raked the coast of Northern California, another juvenile Magnificent Frigatebird turned up in the small town of Healdsburg, on the Russian River, hundreds of miles north of where frigatebirds are found. This bird was quite debilitated, nearly emaciated, cold – as any rehabilitator would have known, the bird was near death. 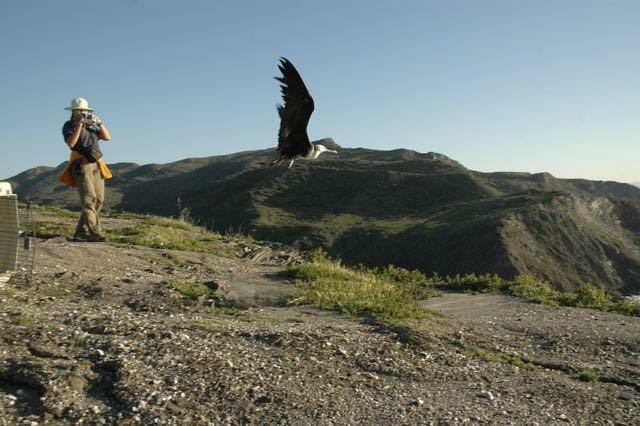 I was working at the San Francisco Bay Oiled Wildlife Care and Education Center, where the bird was taken. Supportive care for this bird was akin to any other species in such a condition – warmth, fluids, easily-digested nutrition gavage-fed through a tube directly to his stomach. 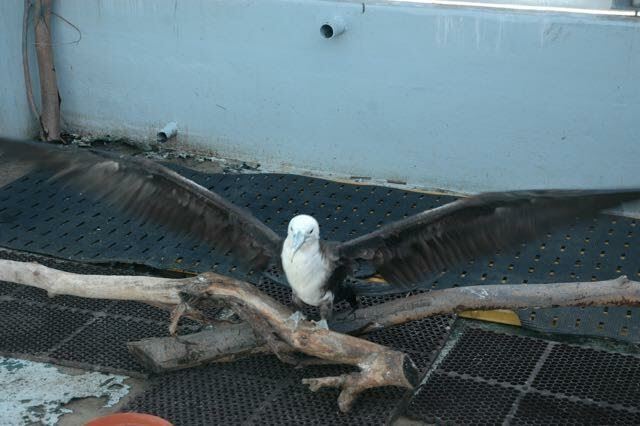 Once stabilized, whole fish were offered, but again, the frigatebird’s natural history required special considerations. Anyone who has successfully cared for an unusual species knows that should one ever be admitted again, all eyes turn to you. As if your lucky break (and hard work) are something you can surely pull off one more time. Like it or not, you’re the resident “expert” now. So, this bird’s care was given to me since I had been involved with the Los Angeles bird four years before. 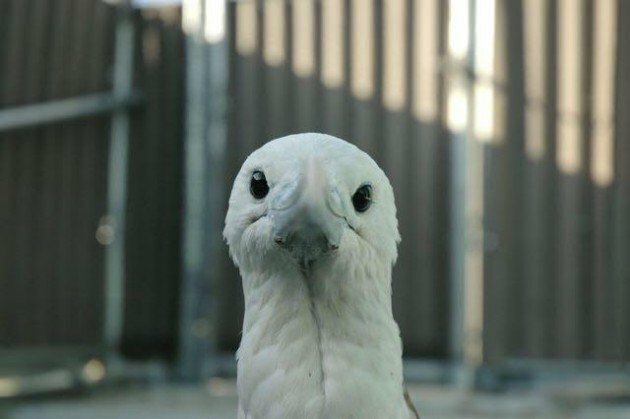 The same protocol was followed, except that in Northern California that year we were going through a very cold and wet winter, and this tropical bird had to be housed indoors for most of his treatment. Treatment took approximately six weeks before we deemed him ready for release. My colleague Marie Travers needed to go to our Los Angeles center on other business so when he was ready, so she took him with her to release. The bird was taken to a high bluff on the southern end of Catalina Island – several hundred miles south of Healdsburg, on a warm SoCal day, and shown an open door. In moments, he was on the wind, hopefully never to be pushed by a storm to Sonoma County again. Thanks for this amazing story and for your important work! Thank you Wendy! As usual, it’s the patients that make the story! I know this is a little strange but would you be willing to provide me with some advice on rehabilitating frigatebirds? Specifically the Ascension Island frigatebird which I know is not the same species you have worked on but I am sure some of the knowledge will be transferable. If you are agreeable I will send a longer e-mail detailing the situation but in short I have so far not had any success with rehabilitating frigatebirds – not even the waterlogged ones. We currently have a near fledged chick which has a wing problem and are debating whether or not to take it in to treat it. Absolutely happy to put you in touch with Monte Merrick, the guest blogger who wrote the Frigatebird post. Will send contact info to you via email. Best of luck on Ascension Island! Where Are You Birding This Third Weekend of April 2015?